Printing standard-size digital photos (like 4" x 6" and 5" x 7") to fit into frames or photo albums requires some photo re sizing. That's because most photo frames are sized for traditional 35mm images, which are rectangular, whereas the size of a digital photo is squarer. We'll show you several simple methods for cropping and printing your digital images. An aspect ratio is simply the ratio between the width and height—the shape of an image. A square photo, for example, would have a 1:1 aspect ratio (width is the same as the height). Most point-and-shoot digital cameras have a 4:3 aspect ratio—they are more square-shaped than rectangular. But a 4" x 6" photo, in comparison, has a 3:2 aspect ratio. This aspect ratio, based on traditional 35mm photo film, has been the standard for decades. If you printed a true digital image without changing its size, the closest measurement to 4" x 6" would be 4" x 5.3"—not good if you have a frame or album page with space for a 4" x 6" picture. This same dilemma applies to all the standard photo frame sizes: 5" x 7" (7:5 aspect ratio), 8" x 10" (5:4), etc. LuJoSoft PhotoCropping will automatically crop your photo before printing. But not all photos are good candidates for automatic photo cropping. Look at your image. Is there plenty of room around your subject? Is your photo centered? If so, then the automatic cropping options should work just fine. If not, an important part of your photo (like the top of someone's head) could be trimmed off when the photo is centered and automatically cropped. If you don't have much space around your subject, or if your subject is off center, then you'll want to crop the photo yourself. 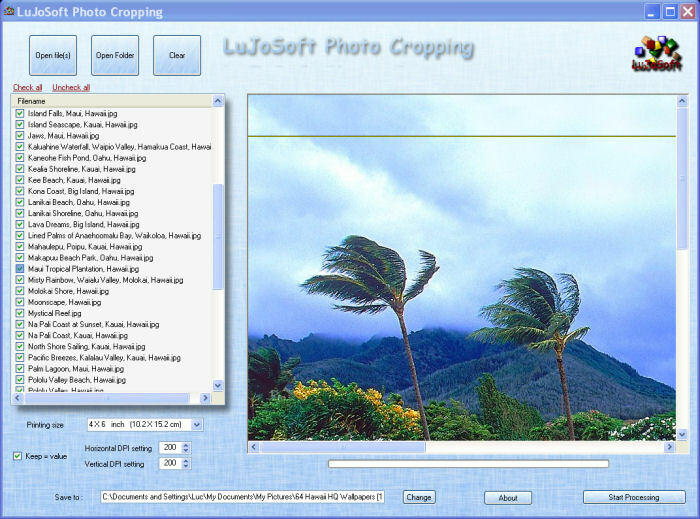 LuJoSoft PhotoCropping is a portable application, no need to install. It's a batch processing application. Supports loading of BMP, JPG, GIF, PNG, and TIF files. Supports most popular print size. You can load your pictures by file name or by a complete folder. You can adjust the DPI for your pictures. Will crop the maximum of all your pictures in the center to fit the desire print. You can choose the destination output folder, if not it will create a default sub folder name "CropImage". Unrar LuJoSoft_PhotoCropping.rar to any folder or desktop. First of all fix all bugs if any reported to me. An automatic resolution control "no more need to stretch the picture to fit picture size. Saving more than Jpeg format. And finally any request made.